Rangers will not play in the Scottish Premier League this season. SPL chairmen met at Hampden to vote on the new club's application to replace the old Rangers in the top flight. The re-formed Ibrox club will now apply to play in the Scottish Football League but it is not clear which division they will enter. "The decision to refuse access into the SPL was an overwhelming one and demonstrates the depth of feeling amongst everyone involved in Scottish football," read a statement from Rangers' great rivals Celtic. "Whilst the financial implications of today's vote for Celtic and for the Scottish game as a whole will be very significant, we have already stated that Celtic has a business plan and strategy independent of any other club. "In addition, we will be working with our other fellow SPL clubs in the days and weeks ahead to take all possible steps to maximise commercial returns, which remain crucial in these economically challenging circumstances." 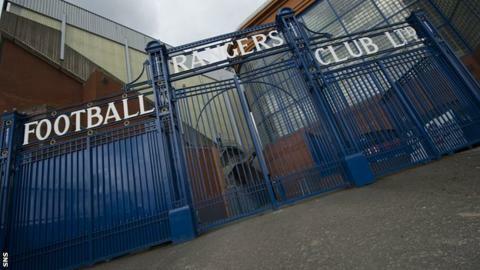 Rangers FC plc entered administration in February owing up to £134m to unsecured creditors. The company will eventually be liquidated and has been replaced by a new company run by Charles Green. The newco has since seen 10 first-team players refuse to transfer their contracts from the previous regime, including skipper Steven Davis and Scotland internationals Allan McGregor, Steven Naismith and Steven Whittaker. There is uncertainty about who will replace Rangers in the SPL: Dunfermline, who were relegated last season, or First Division runners-up Dundee. SFL clubs met on Tuesday to discuss a Scottish FA proposal for Rangers to enter Division One but the Glasgow giants could begin season 2012-13 in Division Three if that idea does not gain the support of a majority of clubs. Eleven out of the 30 clubs have already indicated their opposition to Rangers entering Division One, with a vote scheduled to take place on 12 July. SPL chief executive Neil Doncaster said prior to Wednesday's meeting that three options were available regarding where Rangers should play next season. He said: "The three viable options are effectively: bringing 'newco' Rangers back into the SPL with a range of appropriate sanctions; putting Rangers into the second tier of Scottish football; or Rangers going into the bottom of the pyramid into Division Three. "The third option, I was keen to stress yesterday, would inflict massive damage on the whole of the game in Scotland and effectively punish 41 innocent clubs for the misdeeds of one." Regarding the possibility of Rangers heading down to the First Division next season, Doncaster added: "There's lots of things that need to happen before that might take place. "The SFL clubs will be meeting again next Thursday and will be voting on that. It remains to be seen how that plays out."